How can a congregation become out of balance? If you remember in my last post in this series I wanted to examine deliberately unhooking behavioral issues from the Gospel itself. This week I want to promote the discipline of balance as a mark of maturity that every church should strive for. At one point in my Christian faith, I thought fanaticism was a sign of Christian maturity (though I didn’t think I was a fanatic). Finding the extreme position on an issue and moving toward it with everything I had was the way I wanted to work and anything else was just compromise. I had no clue I was like this at the time. I had no questions. I had no tensions. I walked in absolute certainty of myself. But I was afraid and depressed. I had built a castle of fear around my very small faith. I couldn’t have a conversation with folks, only a monologue to try and convert them to my way of thinking. I went to one church and browsed their library a couple of years back only to find that every book written on theology from every perspective was dispensational or premillennial. The congregation called themselves nondenominational, yet 90 percent of their biblical teaching came from a particular denominational slant. Did the congregation know? No they didn’t. The “gatekeepers” of the congregation were afraid of any other form of biblical teaching, because they were wrongly taught that all others were “liberal.” The congregation, for the most part, wasn’t even aware that there were several other ways to interpret the Bible or end times from a conservative perspective (theologically speaking). This church was out of balance because of a fearful few folks. The congregation wanted to reach folks with the Gospel, but they had isolated themselves on some peripheral issues and become somewhat irrelevant to contemporary issues. They resembled their library, which was from the ‘60s and basically intentionally out of date and out of touch from the world around it, because of fear and control. Churches do this all the time with their worship styles, unspoken dress codes, outdated theology, narrow worldviews and so on reveal who controls the tension in the church. Balance involves constant tension. Tension involves being more than one-sided at least. Imagine holding two bungee cords of the same size one in each hand. Now imagine that you have connected them to two poles on each side of you. Imagine these two poles were 10 feet apart. If you were to close your eyes holding tightly to the two attached bungee cords, you would be able to find the center point between the two poles by sensing the tension on each cord. If you go too far to one side the tension would be greater on one side than the other. Imagine how much more difficult this would be with more poles and more bungee cords. 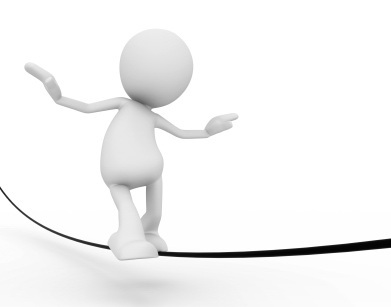 Finding balance involves constantly assessing tensions within a local congregation. A congregation going from one extreme to another needs to find balance somewhere in the middle by managing its sense of tension. What are the “issues” within your congregation? Avoiding tensions will not lead a congregation to a place of balance. Avoiding tensions will only lead to greater and greater tension for one group and less for the other. Proverbs 4:27 reminds us how important it is to actively and deliberately avoid the ditch on either side of the path by walking in tension. Remember, living by faith is marked by tension and the humility it produces rather than the prideful blindness produced by certainty. “We walk by faith and not by sight” (2 Corinthians 5:7). Faith does not draw lines, it walks on the line. Not all lines are the same width. Here are some questions I have had to ask myself in order to find balance. Maybe these are questions to discuss as a congregation every five years or so. What folks or groups make me the most angry when I talk with them or look at them? Why? What am I most afraid of? Is it rational or selfish? Is it reasonable and does it involve others outside of myself? Where are the areas my group and I are controlling out of fear, rather applying love through grace and faith? What do I need to let go of in order to build a relationship with this person or group? Is it an essential item or can I go without it? Every person and group has primary and secondary values. What primary values do we share? Can I enjoy unity on shared primary values and accept the tension that comes with our different secondary issues? Do I need to reexamine some of my primary values? Perhaps, in doing this, I will appreciate the complexity of a particular issue and make room even among my primary values.